Barack Obama; it is clear with this president that continued fluffing of your ego also results in deflating of your character. Someone please contact Edward Snowden and ask him to forward Lois Learners lost #IRS emails to the House Oversight Committee. At least someone, Texas’ Katrina Pierson in this case, has figured out a way to both possibly recover the Lois Lerner’s emails which Obama’s IRS criminally destroyed and make some use out of the heretofore useless traitor, Edward Snowden. ‘Tis but the scattered reflections from a murky pond that come from here. Yet the pond is deeper than that and, though murky, it holds within its darkling waters beauty. So don’t be too afraid to enter it. Exert some caution though; some of the naiads are rusalky. I guess that when all else fails, especially one’s attempt to rule rather than legally govern, all one is left with is whining about how others are being mean to you. This, at least, seem to the route that Obama has chosen to travel. The boy be whining now about how the Republicans in Congress call him names. Really? The office of POTUS has come to this? I wish I was joking or that this was hyperbole on my part, but it isn’t. Friday, June 27, 2014 Obama got up in front of a bunch of voters in Minneapolis, MN and, instead of speaking on the economy as his speech was billed, decided instead to whine about those “mean and nasty” Republicans. “They don’t do anything, except block me and call me names,” an indignant Obama said against a backdrop of sailboats and a band shell shaped like a castle. And this is the reason, by the boy’s own words, that he’s repeatedly chosen to illegally bypass the Legislature via a string of executive orders or through equally illegal recess appointments. Now think about the sad and horrific fact that America’s domestic enemies and their minority chattels have twice given this pathetic, narcissistic boy an army to abuse and misuse. Think also on the fact that “They call me names” is Obama’s best available ploy to get Democrats to the polls in the 2014 midterm elections, which is what the boy’s whining, petulant, screed was all about…assuming his Narcissistic Personality Disorder hasn’t just reached the point of decompensation. Times come to all Peoples when one so besmirches an honored roll that, in order to respect the position, one must disrespect the individual holding and befouling it. The truth be told, given the situation in Iraq, such a desperate gambit by Maliki is Iraq’s last, best hope. 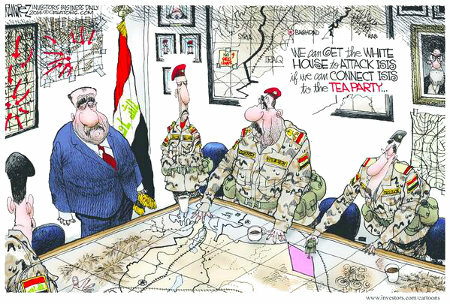 The only way that Obama will render them any real assistance before the 2014 midterm elections are over is if the Iraqi government can somehow connect ISIS with the Tea Party. Time passes but rarely truly changes. Peoples and nations plod head down and with heavy, stenorous tread through the well-worn ruts of history, marching like blank-faced automata through the pageant of birth, rise, stagnation, tyranny, and fall. Certainly, America has it players for the parts of King Louis XVI and Marie Antoinette in the persons of Barack and Michelle Obama. So too do we have a clergy, in the form of the intelligentsia, preaching the Divine Right of our would-be king and that of their aristocracy. It then devolves to the American people to play the part of the Girondins or, needs must when the Devil drives, the Jacobins, for are we not already a society of the friends of the Constitution? 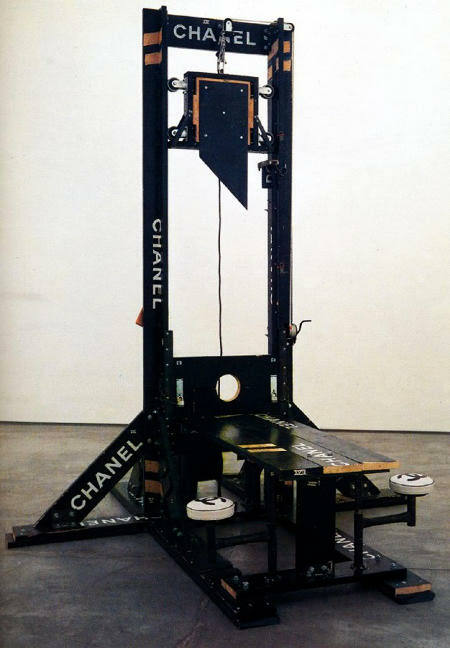 Because, be it through means of Brissot or of Robespierre, something must be done to save America from the fast-approaching tyranny. The Universe spirals downward to dissolution while the Reaper sits by, drinking tea sweetened with dead stars.